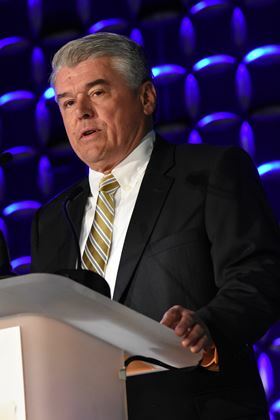 Patrick J. McGeehan, president, Metal Powder Industries Federation presented at PowderMet 2016. The entrepreneurial spirit still rings true in the powder metallurgy (PM) industry, and confidence remains strong within executive offices and on the shop floors in the majority of PM industry companies. Following a healthy 2015, the year opened on a positive trend with modest growth forecast by most informed observers. Conventional press-and-sinter companies and metal powder producers report good business levels, as well as companies involved with metal injection molding (MIM), metal additive manufacturing (MAM), and hot isostatic pressing (HIP). The demand for refractory metals, however, has continued to decline. 2015 wrapped up another modest-growth year for metal powder shipments. Total North American iron powder shipments increased by 1.73% to 384,173 mt (423,565 short tons (st)), with the PM sector reflecting 91% and growing by 2.3% to 349,702 mt (385,559 st). Other sectors representing welding, cutting, scarfing, and lancing dropped off substantially. Stainless steel powder shipments increased by an estimated 2.5% to 7,347 mt (8,100 st). Copper powder shipments increased at the same amount to an estimated 16,272 mt (17,940 st). Aluminum remained about even with the previous year at 36,280 mt (40,000 st). Other powder shipment estimates were: nickel 5,551 mt (6,120 st); molybdenum 1,760 mt (1,940 st); tungsten 2,630 mt (2,900 st); and tungsten carbide 4,263 mt (4,700 st). Total estimated metal powder shipments in 2015 increased by 1.2% to 458,275 mt (505,265 st). Developing metal powders for metal additive manufacturing via gas atomization is a new trend set for acceleration by most leading powder makers. Meanwhile, MAM's successful use in the aerospace and medical sectors continue to pave the way for future applications. Although the MAM market currently remains small and limited to about 15 commercially available materials, it offers exciting promise for PM in the years ahead. Another trend is the growing need for precision machining of PM parts. Powder suppliers are introducing high-performance lubricants and additives for the press-and-sinter PM market. The aluminum powder market for PM parts applications is undergoing a new surge as automotive designers seek lighter weight parts. The use of higher-strength aluminum alloys with metal matrix composites (MMCs) is showing renewed interest to reduce mass and provide improved properties, and this focus is currently a project within the Lightweight Innovations for Tomorrow (LIFT) consortium. This industry-led, government-funded consortium is investigating the development of a cost-effective process for sub-micron reinforced aluminum MMCs. As a member of LIFT, MPIF is supportive of this initiative. In 2015, traditional PM equipment suppliers, tool makers, compacting press builders, and sintering furnace manufacturers, were the beneficiaries of parts makers upgrading their capabilities, while parts makers added new, more-efficient equipment. Tool makers are meeting requirements for tighter tolerances, ranging from plus or minus five to ten micrometre, and more complex, larger-size parts. They are investing in state-of-the-art equipment with high-speed machine tools with coatings on cutters, programmable consistent chip loads, and capabilities for different helix and rake angles. Sintering furnace builders continue to provide more controls for data acquisition such as temperature loop feedback and gas flow. Furnaces are also being retrofitted for rapid cooling systems to assist in sinter hardening and increase throughput. Larger compacting presses above 500 tons are a bright spot for compacting press sales as requirements for larger, more complex parts continues to grow. Overall, PM parts makers fared well in 2015, especially firms selling heavily into the robust automotive market. Major markets such as automotive, appliance products, and lawn and garden equipment experienced single-digit growth, while demand from the off-road and agricultural equipment markets weakened. Western Pennsylvania PM parts makers enjoyed moderately busy production levels, but continued facing skilled-labor shortages, a lingering problem throughout North America. Furthermore, connecting with the millennial generation is a problem faced by many industries, not just our own. While 2015 North American light-vehicle production soared to a record 17.4 million units, automotive experts point to a plateauing or declining of PM content without any significantly new applications. However, there is across-the-board good news in sinking gasoline prices, which have revved up sales of larger light trucks and SUVs. These models typically contain more than 27 kg (60 lb) of PM parts. But another roadblock is the running trend to downsizing from eight-cylinder engines to six-, four-, and now even three-cylinder engines with smaller transmissions. Smaller engines need fewer connecting rods and bearing caps, and smaller transmissions need smaller carriers and gears. In addition, the trend to hybrids, electric and alternative vehicle power systems, while not an immediate threat to PM, will have a more serious impact in the next decade. A major OEM auto maker is transitioning to new nine and ten-speed transmissions containing only three pounds of PM parts, compared to ten pounds of PM parts in the previous transmission design. Accordingly, one observer believes that PM content in vehicles will erode by 0.23–0.25 kg ( 0.5–1 lb) annually for the next five years. However, there is good news in the increasing dollar value of PM parts because of more value added steps and part complexity. Ahead of the US government’s auto corporate average fuel economy (CAFE) standard of 54.5 miles per gallon in 2025, the design of lighter weight vehicles will continue its rapid pace. This daunting and controversial standard, nevertheless, offers an important opportunity for high-strength PM aluminum parts. For example, an automatic transmission one-way clutch retainer represents an innovative PM aluminum MMC application that provides improved wear due to the ceramic embedded in the softer aluminum. Another example of PM aluminum’s advantage is going from a steel main bearing cap at 0.8 kg (1.76 lb) to an aluminum substitute at 0.3 kg (0.66 lb), a no-brainer weight reduction. PM is a lightweightenabling technology, something to promote further. Slower growth impacted the U.S. MIM industry in 2015 mainly due to the decline in the domestic firearms market. The annual North American powder market is estimated to range from 1.2 to 1.6 million kg (2.7–3.5 million lb). The decline in the firearms market that began during late 2014 impacted 2015 powder demand. Despite this, 2015 MIM parts sales still grew modestly in the lower-single digits. The 2015 decline in firearms drove a shift in market mix for MIM parts by weight of parts shipped to medical/dental (32%) as the leading MIM market, followed by general industrial (26%), firearms (21%), automotive (7%), electronics (6%), and miscellaneous applications (6%). Automotive and aerospace applications are gaining as well as cutting tools. However, while the firearms market declined in 2015, knowledgeable observers forecast the market increasing in 2016 to a more normal growth pattern, or possibly spiking again. Recent mass-casualty shootings in North America have impacted firearms sales as citizens seek personal protection options and react to proposed tougher gun controls. Overall, the majority of members of the Metal Injection Molding Association (MIMA) forecast business increasing in the 5%–10% range in 2016. The HIP business was strong last year for metal powder products and densification of MIM parts. All powder-related applications (canned powder shapes, MIM, and MAM parts) account for an estimated 20%–25% of HIP business with the balance going to castings. Aerospace applications are growing, while energy-related applications in the oil-and-gas market suffered steep declines. Moreover, the HIP industry recently added a substantial amount of new capacity to meet increasing demand through 2018. While the hype for metal additive manufacturing (MAM), rapid prototyping, or 3D printing has calmed down somewhat, an estimated 50 to less than 100 companies and organizations (job shops, captive operations, universities, and R&D firms), are actively pursuing MAM and development programs using metal powders. To this end, machine sales are surging, but most MAM installations are producing parts in short runs of up to 100 units. Aerospace, nearly always an early adopter of bright technologies, has grabbed the reins to charge ahead with the use of MAM, along with the medical market segment. Three significantly longer-running commercial PM applications remain in the forefront: titanium medical implants (acetabular cups, individual teeth, cranial implants), cobalt-chrome dental copings, and cobalt-chrome aircraft nozzles. Thus far, the leading MAM powder materials include 316 and 17-4 PH stainless steel, cobaltchrome, and titanium. Other materials used in MAM development programs include Inconel 625 and 718 alloys, platinum, molybdenum, and tungsten. For example, one company suggests MAM of molybdenum and tungsten collimators and anti-scatter grids for CT scanners and gamma cameras. Most companies in the PM industry view MAM as a complementary technology and an opportunity to enter a new technology sector. We must continue to monitor this growing segment of our industry while looking for ways to nurture this complementary relationship. The tungsten market continues to experience difficult times with no immediate relief in sight. North American oil-and-gas drilling rigs are at the lowest level in decades. Mining activity is virtually stagnant. Both of these well-established tungsten products markets play an important factor in the PM industry. Tungsten powder shipments estimates declined from 3,265 mt (3,600 st) in 2014 to 2,630 mt (2,900 st) in 2015. Similarly, tungsten carbide shipments estimates have declined from 5,351 mt (5,900 st) in 2014 to 4,263 mt (4,700 st) in 2015. The bright spot is that non-mining and energy related demand continues at a steady pace, mirroring guarded confidence in the U.S. economy. A further weakening of energy prices has impacted the tungsten business again, as well as weakening commodity prices curtailing mining. The MPIF Technical Board continues focusing attention on lean alloys, advanced PM steels, and thermal processing along with new lightweight materials to meet new CAFE goals. New lightweight PM alloys and novel PM processing techniques have the potential of reducing the weight of PM parts by 10%–30%. The Technical Board is also studying other technology issues such as using computer analysis to better understand how powder grains consolidate, low-cost HIPing for net-shape parts and dimensional variation in PM parts. The latter review concerns how materials react to heat treatment and compacting with the goal of achieving closer tolerances and reducing the need for extensive machining. Additionally, during 2016, the Technical Board will assess and update the PM Industry Roadmap, most recently revised in 2012, to ensure that our industry has identified the technology challenges to remain the preferred metal-forming solution. The Center for Powder Metallurgy Technology (CPMT) continues to work on projects launched in 2015: investigation of how shot peening can improve PM gear performance; testing a new die wall lubrication process for warm-tooling; studying resonant acoustical powder blending; and improving sinter-hardening with low-mass carbon-fiber plates. The ongoing low-cycle, strain-controlled fatigue study, in coordination with the MPIF Standards Committee, has resulted in new data for the MPIF Standard 35 Structural Parts, including recently added aluminum data. Overwhelmingly, most MPIF members forecast sales increases in 2016. Metal powder suppliers predict modest shipment increases similar to 2015. PM parts makers, depending upon what markets they serve, see business increasing in the mid- to upper-single digits. MIM companies forecast growth in the 5%–10% range. In the annual PM Industry Pulse Survey, 42% of responding MPIF members will increase capital spending in 2016, with 52% reporting remaining even with 2015. Besides the optimism, clouds of geopolitical uncertainty overhang the U.S. economy— including the PM industry. US manufacturing may be stalling and in a rut according to many economists. We must be prepared for a flattening of automotive growth possibly beginning by next year, 2017. The press-and-sinter sector of our industry is maturing and must address the challenges. More investment of R&D at all levels is vital. End-user education is another never-ending theme that also rings true. But one positive constant has run through this industry throughout its history. We continue to be a community of innovative entrepreneurs, engineers, and scientists who refuse to believe the critics and continue to surprise the engineered-materials community with PM’s advances. The future remains positive, and PM is a 21st century technology that will continue providing new exciting materials with special properties and process improvements.